Johns Hopkins University appears in our ranking of the 30 Best Online Schools for Graduate Degrees. Johns Hopkins University is a full university in Maryland that offers degree programs for both full-time and part-time students. Students can earn doctoral degrees from the university as well as bachelor’s and master’s degrees and some certificates. There are dozens of programs available at the bachelor’s level that prepare students for their future careers and for attending graduate school. Some of these are unique programs such as its Africana Studies program. Students can earn degrees in many different medical fields, including nursing and biomedical engineering. Other majors are available in marketing and communications, history and business. In addition to traditional bachelor’s programs, Johns Hopkins University offers a few online programs for undergrads. Online students can study civil engineering, electrical and computer engineering, computer science and environmental engineering. These majors are also available as hybrid programs that feature both online and offline work. More than 60 degree programs are available for graduate students. The business administration/MBA program offers a global and a flexible option. Its global MBA is a traditional program that looks at aspects of the business industry around the world and focuses on all areas of today. Those in the flexible MBA program will study similar subjects but can earn their degrees as they take online and traditional classes. Other graduate programs are available in chemistry, environmental planning and management, and nursing. Some of the majors for online and hybrid students include applied economics, global health planning and management, and teaching writing. There are just as many options for doctoral candidates and those who want to earn certificates from the university. 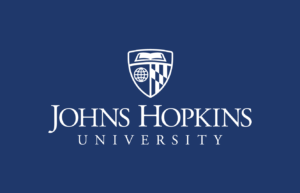 Some of the majors that Johns Hopkins University offers for doctoral students include behavioral biology, education, environmental health sciences, sociology, and nursing. Certificate programs are available at all levels and include studies in fields such as adolescent health, applied physics, epidemiology for public health professionals, financial management and STEM teaching. Johns Hopkins University is one of the top public colleges in the United States. Established in 1876, it also ranks among the oldest schools on the East Coast. Known as both JHU and Johns Hopkins, it has a strong reputation for its medical and health programs. The university has its own health system that allows students to gain the experience they need in the field, but it also has partnerships with other health care organizations around the world. Located in Baltimore, Maryland, it was one of the nation’s first schools to adopt an equal rights program to accept African American students. JHU now has a medical campus in East Baltimore and a downtown campus. There are also JHU campuses in Homewood and Laurel, Maryland and in Washington DC. ARWU ranked JHU as the nation’s 15th best university, and both U.S. News and World Report and Washington Monthly rank the university within the top 50 of all American schools. Those same groups also rank it as one of the top 50 schools in the world. JHU now offers hundreds of degree programs across all levels and has a few dual degree programs available. Its enrollment includes more than 15,000 graduate and post-graduate students and more than 5,000 undergrads. Some of the accreditation that JHU has comes from the Accreditation Commission for Education in Nursing (ACEN), Council on Education for Public Health (CEPH) and Council for Accreditation of Counseling and Related Educational Programs (CACREP). It also has regional accreditation, which comes from the Middle States Commission on Higher Education (MSCHE). This authorizes JHU to create financial aid packages for those who apply and to evaluate and accept the transfer credits that students bring with them. As JHU is quite selective, it’s important that students know how the application process works. The university only accepts around 14% of the undergrads who apply every year. Students can submit their applications by the early decision deadline of November 1, but they must agree not to apply anywhere else and to attend JHU if accepted. The university extends this deadline to January 1 for all other students. Undergrads can use the Common Application, Coalition Application or Universal College Application when applying, and they can pay the application fee on any of these sites. The university asks that they complete the JHU supplement on each one and that they submit a score from the SAT or ACT, a secondary school report and two evaluation forms completed by their high school teachers. JHU also requires a mid-year report to make sure that students maintained their high grades. The number of graduate and doctoral students accepted each year is even lower. Those applying to a graduate program need a bachelor’s degree and a GPA of 3.0, but some programs require an even higher GPA. Doctoral programs will only accept students who have both a bachelor’s and a master’s degree with this same GPA. Students usually need to supply their resumes, letters of recommendation and writing samples too. Some programs ask for proof that students have professional credentials or a form that allows it to do a background check also. As JHU is a private university, its overall costs are quite high. Undergrads pay close to $47,000 a year for their tuition and university fees. The cost for graduate students starts at $774 per credit hour and can climb to more than $59,000 a year. Doctoral candidates pay around the same amount that graduate students do. Most students attending the university will receive financial aid though. JHU offers different programs and options that can completely eliminate the student’s out of pocket costs. Incoming freshmen receive an average aid package of more than $43,000 a year. When creating its financial aid packages, JHU will look at whether the applicant is an undergrad or graduate student. Packages for undergrads can include work opportunities, grants, loans, and scholarships. The university actually tries to create packages that include fewer loans and more funds that students do not need to pay back. It awards students dozens of grants and scholarships too. Graduate financial aid packages can include work opportunities and scholarships too. Johns Hopkins University awards new and returning students in all of its degree programs more than $100 million in institutional and government financial aid every year.